Very easy leaving Costa Rica as there was nobody else at either immigration or customs. Panama took a little longer, first finding the immigration office in the police station, then walking around the corner and getting insurance for the month. I apparently picked the wrong insurance office, it took almost half an hour to get my details entered and the insurance printed out. Then to customs with all of the usual copies of my documents. After receiving the temporary import permit, back around the corner to the fumigation station. There is no fumigation going on nor any evidence of any kind of fumigation equipment. Just pay $1USD and get the fumigation form. Back across the street to the police station and hand the officer at the front desk copies and I’m done. As I leave the border it starts raining quite hard. I’m up in the mountains on the usual very twisty road and in pouring rain it’s pretty slow going. I had intended to make it to Boquete but once the sun sets and the rain continues I stop at a hotel in the nearby city of David. Next morning off to Boquete in the sunshine. Pull into the last open parking/camping spot at Pension Topas next to my friends Will and Cate and set up camp. Weather here is great, sunny and not too warm. It’s a beautiful little town full of American, Canadian, and European expats. Lots of good restaurants. On the other side of the main street is Mike’s Global Grill. Mike is from Chicago and has decorated his place accordingly. Great food and happy hour specials. I had the No Bueno hot wings, which were truly the hottest wings I have ever eaten. If you squint a little it’s just like being in a Wrigleyville bar. Around the corner is an excellent bakery and cafe. I start my mornings here with either breakfast or one of these tasty muffins. I was walking to the grocery store when I saw Dr. Luz’s clinic and realized that I was due for a cleaning and checkup. Made an appointment for the next morning. Dr Luz does all the work herself, no hygienist or receptionist, so it went quickly. Very nice place, all of the modern equipment. 30 minutes later I was out with a clean bill of health and clean teeth for $40USD. After a week in Boquete I headed to the Pacific coast, on the way to Panama City. Roads here in Panama are pretty good. Stopped for a few days at a surf camp outside Santa Catalina. The road ends at the river, which you have to drive across to get to the camp on the other side. It’s pretty shallow at low tide, just have to make sure I time my departure with the tide. Nice spot right on the beach, I can lie in my tent and watch the waves rolling in. On to Panama City. The PanAm highway is easy going and I drive 260 miles in one day, probably a record for Central America. 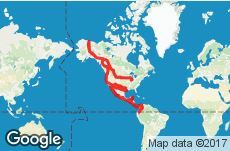 I have been focused on the details of shipping to South America and hadn’t really thought about the Panama Canal and the end of Central America. It was a big moment crossing the Bridge of the Americas, entrance to the Panama Canal, and coming into Panama City. Panama City is huge, very modern with the only subway in Central America. I’ll be here for a week arranging shipping, staying at the Best Western. Very nice room with strong AC, important as it is crazy hot here. Also has an indoor parking garage. The garage clearance is 2.3m and the Land Cruiser is 2.25m with the rooftop tent so I drive very carefully up to a parking spot on the 4th floor. Shipping to Colombia is the most complicated and expensive border crossing yet. We have a shipping agent who deals with the container line, but she only communicates with us via email. We still have to navigate from place to place and get all of the red tape done by ourselves. The container ship leaves from Colon on Saturday, but you have to check your vehicle in at Colon by the Wednesday before. Prior to that you need an inspection for export and a background investigation for export completed in Panama City, which takes a full day. We’re both here early so we decide to get the inspection and investigation done on Friday. For the vehicle inspection you have to arrive at the customs inspection yard in a shady neighborhood at 7:30 am, get a number, then park with your hood open so the engine can cool down. Inspections don’t start until 9:00 am. Once they get going they do the foreigners with campers and RVs first, probably to get them out of the way as the lot is really crowded. For the foreign vehicles they just check the VIN against their paperwork, collect copies of our documents, and send us off. The Panamanian vehicles get a thorough going over, they take impressions of the engine serial number, VIN on the frame and body. Once that is complete we need to return to the nearby Secretary General’s office in the afternoon where they determine the vehicles are not stolen and there are no outstanding fines or tickets. More copies of everything: driver’s passport, driver’s license, vehicle title, vehicle registration, and Panama temporary import permit. After a long wait we are called up one by one and receive the official document giving permission to take the vehicle out of the country. Cate with Moby waiting for inspections to start. It’s really hot already at 8:30am. We send our agent copies of the permission documents and she tells us that we have to make the full payment at a bank in Panama City before proceeding to Colon to drop off the vehicles. It’s Saturday morning and Will and Cate have already left the city for the weekend. As we are planning to drop off the vehicles on Monday and the bank is closed on Sunday, there is only about an hour left to get it done. Luckily I have enough cash on hand to cover the entire amount so I jump into a taxi with $1,800USD in my pocket and head to the bank. Although Google assured me that it was open til 1 pm on Saturdays, the sign on the door says 12:30. It’s 12:24 when I jump out of the taxi and quickly enter. For the payment I just make out a deposit slip with the agent’s name and account number and hand it over with a big pile of cash. With the day’s task completed and the pile of cash safely in the bank I decided to walk back to the hotel in order to see a little of Panama City. It was a hot and sweaty walk, had to stop halfway for a cold drink. On Sunday I drove over to the Panama Canal Locks and Museum. The museum has tons of stuff on the construction and operation of the canal, including the new super sized locks that just opened. I was lucky enough to see a ship coming in from the Pacific and going through the locks, there is a large shaded viewing stand in front of the first lock. Monday off to Colon, about and hour and a half drive on the highway. First stop is at the Seaboard Marine office to get stamped copies of our bill of lading, then down the street to the customs office where they get three copies each of: bill of lading, police permission certificate, driver’s passport, driver’s license, vehicle title, insurance and the temporary vehicle import permit. They issue a cancelled temporary import permit and put a stamp in my passport saying it’s OK to leave the country without my vehicle. Back down the road to the actual port, we park outside and walk in to get more paperwork done. It takes forever due to some kind of computer problem, but eventually we get our documents processed and pay the port fee. We finally drive into the port and park in the valet lot waiting for the customs inspection. The inspector shows up with his dog, rifles around the vehicles a bit then runs the dog through. The valet guy takes detailed pictures all around our vehicles and we hand over our keys. I’m a little disappointed that we don’t get to drive into the container, or at least see our vehicles going in. We walk out to the road and catch a taxi to the bus station in downtown Colon. The whole city is pretty sketchy and this is the sketchiest area. Instead of waiting for the bus Will and Cate order an Uber ride to their hotel near the airport and I tag along. Then just a $30 taxi ride from the airport and I’m back at my hotel. I spent a couple more days in Panama City just relaxing and walking around. It feels good to be in a big modern city with all of the associated conveniences, and it feels very good to have the first half of the shipping to South America completed. Then back to the airport for the flight to Cartagena with a stopover in Bogota. After Monteverde our last stop is on the beach again, at Playas del Coco near Liberia. Another Airbnb for three nights, a comfortable townhouse with AC, right on the swimming pool in a little development a couple of blocks from downtown Playas del Coco. It’s a great place with a supermarket and several restaurants right around the corner. A day relaxing out on the beach. It’s Easter Sunday but not very crowded. Next day we take a snorkeling trip off the beach. It’s on a diving boat and while the divers do their thing a few of us go off snorkeling at several spots. Due to recent weather the water is a little cloudy but we see a lot of fish. At one point we saw a sea turtle off the bow while we were taking a break; I jumped in but couldn’t catch up with it. After almost three weeks Lisa’s trip is ending. We have a delicious breakfast at a German cafe surrounded by giant iguanas begging for food, then one last Costa Rican iced coffee. I drop Lisa at the airport then head south towards Panama, the last country in Central America. After all this time traveling through Costa Rica together it feels odd not having someone in the passenger seat. I make one long day’s drive down the PanAm highway, past Monteverde and Manuel Antonio, stopping along the coast for the night. Friends have told me that the main border crossing to Panama at Paso Canoas is a nightmare, so I head to the smaller crossing up in the mountains at Rio Sereno. Before crossing I stop in the town of San Vito to use up the last of my Costa Rican colons. A hearty lunch then off to the gas station where I get 8,492 colons worth of gas. Back up into the mountains, we are are spending three nights in the Monteverde Cloud Forest. First day we take a hanging bridges tour through the cloud forest. We don’t see much wildlife, but the cloud forest is pretty cool. I’m still scanning along the sides of the trail hoping to see more tiny frogs, but the best I can come up with is this giant millipede. In downtown Santa Elena. It’s odd because the last 12 miles or so of the road up here is unpaved, very rough and rocky, then once you get into town it’s nice smooth pavement. We stop in a little coffee shop and Lisa gets one of her favorite Costa Rican iced coffees. We’re staying in a little Airbnb house about a mile outside of town. They have several dogs who are always happy to see us, including the greatest little puppy. We visit the Monteverde Cloud Forest Reserve. Lots of great trails through the cloud forest. We get an early start, so it’s still quite cloudy. Again, not much wildlife but lots of unique plants. On our last night in Monteverde we take a night hike through the cloud forest. It’s a lot of fun and we actually see more wildlife than we did walking through the forest during the day. A tiny frog. Sorry for the blurry pictures but it’s hard to get a good shot with just a flashlight. and several birds roosting for the night. We saw a hummingbird nest with baby hummingbirds but I couldn’t get a good picture. From Costa Rica’s Central Valley we drive south then east on the Pacific Coast to Parque Nacional Manuel Antonio. It’s a small park but very beautiful and supposed to be full of wildlife. On our first day here the park is closed so we head to the beach. For about $10USD we get a parking spot right on the beach plus our own beach chairs and umbrella for the day. The beach chairs are nice but they’ve seen better days; every time I get up or sit down another piece of plastic falls off of mine. We have dinner at El Avion, an old cargo plane parked up over the beach and converted into a restaurant. It’s a great place to watch the sun set. Next morning we spot some wildlife even before leaving the our hotel/casino, there is an agouti scurrying around the grounds. Since the park is so small they limit the number of people allowed in at any one time. We have to wait maybe 15 minutes at the gate for people to leave before we can enter. There are several trails through the park, none very long so it’s easy to go everywhere. First wildlife sighting in the park is this little tree frog, I have been hoping to see one of these in Costa Rica. Next is the famous Costa Rican Laughing Deer. Lots of giant land crabs lurking in the jungle. There are several beaches in the park. It seems like most of the people come here for the beaches rather than hiking around the park. Probably because this is the start of Semana Santa (Easter Week) when everyone abandons the cities and heads for the beaches. This one is the closest to the entrance and the most crowded, but still not bad. It’s a perfect day for the beach. There are monkeys everywhere in the park but it never gets old watching them frolic in the trees. Then down to another beach. These raccoons were begging for food from everyone who passed by. Another agouti. They’re hard to spot because they blend in so well but every once in awhile we would see one scurrying through the jungle. Another stunning beach, less crowded as it’s farther from the entrance. Plenty of monkeys here as well. Next day we drove back towards Liberia, crossing the famous Crocodile Bridge. For some reason dozens of huge crocodiles hang out in the water here by the highway bridge. Given all the concessions at the end of the bridge I suspect there’s somebody throwing chickens off the bridge every once in awhile to keep them here. Everybody parks off the end of the bridge then walks out to see the crocodiles. No big fences or anything, just a standard highway railing not even waist high.